You may know of the different vocations in the Church, the married life, the priesthood, the consecrated life. But all these vocations are different expressions of one common vocation – the universal call to holiness. This is because heaven is our ultimate vocation. We are called there by God. We are called to be saints! Though many in false humility or self-honesty would refute the claim that they are saints, having heaven as our goal is practically saying, “We want to be saints!” But just like any vocation, we can accept it or we can reject it. It requires a choice and a choice that orders all others. If we choose eternal life with God in heaven, our choices now must be ordered to it. We should choose Him in daily life: choose Him on Sunday mornings by coming to Mass; choose Him during the day and pray; choose Him in our moral lives, choose Him in our relationship with others, choose Him in how we deal with material things; choosing Him instead of sin, and when we do sin, choose to come to Him and ask Him for His forgiveness in the Sacrament of Penance. Choose Him more and more each day! Many think that sainthood is a privilege reserved only for the chosen few. Actually, to become a saint is the task of every Christian, and what’s more, we could even say it’s the task of everyone! 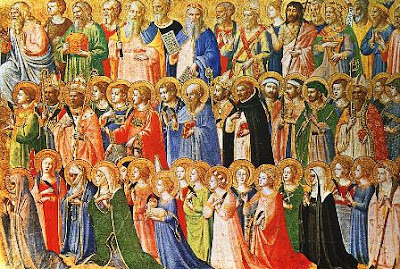 Notice the name of today’s feast – “All Saints.” The inclusive “all” is meant to encompass both the named and the unnamed saints. The simple truth is that everyone who is in heaven is a saint, not just those who have been officially declared saints, but all those who have chosen God during their earthly lives and whom God has rewarded by granting them their choice eternally: to spend eternity with God in heaven. Many of these people were great sinners, but, responding to God’s grace (which is always there), they ended up turning to Him and choosing Him the rest of the way. Most of them were not even aware or thinking of becoming saints. The good thief chose God on the Cross and on that day, was with Him in paradise. On the other hand, those who freely choose against God in this life, who choose against Him in their daily choices in place of selfish self-interests, God also gives them eternally what they want: to selfishly choose themselves rather than God. They got what they worked for, they got what they desired, and they got what they chose. We call this place Hell, a state where souls have excluded God eternally. In Pope Francis’ latest encyclical, Gaudete et Exsultate, dedicated to this theme of extraordinary “ordinary holiness”, our Holy Father tells us, “(God) wants us to be saints and not to settle for a bland and mediocre existence.” (GE #1) This is the truth we celebrate today. We are all called to be saints. This can sound like a lofty goal, something reserved for special people. It brings to mind great heroes and heroines of the faith, the martyrs of the Church, extraordinary holy individuals like St Teresa of Kolkata or St John Paul II. Sometimes God calls people to be Gospel witnesses in these exceptional ways. But more often, He doesn’t. More often, God encourages us to answer the call to holiness in less dramatic, but no less, important ways, in our day-to-day interactions with spouses, parents, students, neighbours and parishioners. If you wish your family, BEC, ministry or parish to flourish, simply seek to grow in holiness. The reverse is also true. If you wish to destroy or impede the growth of your family, BEC, ministry or parish, then choose the path of sin, selfishness and vain-glory. What’s the winning formula for saintliness? We can begin with the Beatitudes. The pope calls them “a Christian’s identity card.” Living according to the Beatitudes helps us to become the saints God wants us to be. But that doesn’t mean the journey will be easy. Many have tried to live up to them, but then quit because they appeared to be too hard or not rewarding enough. Some only pay the Beatitudes lip service, others try to redefine them, while still others completely reject them. There will be challenges, sometimes very difficult ones, along the way. We will need God’s grace and a healthy dose of self-discipline to do it. But, thankfully, we have the support of the saints already in heaven, which our liturgy calls the “great cloud of witnesses,” who are praying and interceding for our benefit as we journey down the path of holiness. To believe greatness is attainable, we need successful role models to emulate. There is a desperate need for real heroes and heroines, models and witnesses of faith and virtue that the world of sports, cinema, science and music cannot provide. If you have visited the Holy Land, you will soon discover that the putative site for the Sermon on the Mount, the Mount of the Beatitudes is only a few dozen feet above sea level, but for us Christians it is spiritually the highest peak on earth! On this holy mountain in Galilee, Jesus proclaimed the new law that was the expression of Christ’s holiness. They are not an abstract code of behaviour. Jesus is the poor in spirit, the meek, the persecuted, the peacemaker. He is the new “code of holiness” that must be imprinted on hearts, and that must be contemplated through the action of the Holy Spirit. His Passion and Death are the crowning of His holiness. St John Paul II, who canonised more saints than all his predecessors once taught, “At difficult moments in the Church’s life, the pursuit of holiness becomes even more urgent.” How true! Every crisis that the Church faces, every crisis that the world faces, is a crisis of holiness and a crisis of saints. As a corollary, Pope Francis tells us that “to the extent that each Christian grows in holiness, he or she will bear greater fruit for our world.” (GE # 33) In recent times, as we are inundated with news of our leaders, our shepherds, consecrated men and women, struggling not only with mere foibles or personal weaknesses, but even with the gravest of mortal sins, we need more than ever to have authentic and believable witnesses who swim against the current of rot and aspire for the heights of holiness.